From the 8th to the 11th May, COLLAR Company took part in Interzoo-2018. Interzoo is the leading international exhibition of the world pet industry, which takes place in Nuremberg (Germany). Manufacturers, distributors and service providers from more than 60 countries presented their products. The meeting of representatives of the world market of pet products was held at the Nuremberg Exhibition Center (Nurnberg Messe). Our Company installed the largest booth in the history of German exhibitions, – 18 meters in length. This year, for the first time in the history of the exhibitions, we presented the COLLAR Development Zone and the process of creating two of our products. This is a leash EVOLUTOR and flexible LED lamp for aquarium AquaLighter PicoSoft. Also in the Development Zone, the Company introduced the world’s first wireless aquarium. The technology of a wireless aquarium is unique and we are ready to share this technology with everyone who wants to develop it. Hundreds of people visited the company’s booth every day. Customers who visited the COLLAR booth came from all over the world: from Australia and Japan to United Kingdom and USA. It was pleasantly surprised that the company’s products were one of the few at the INTERZOO-2018 fair that was really innovative in terms of functionality. The owner of the company Yuri Sinitsa and the whole team thank our partners and visitors for the desire to be with COLLAR on Interzoo 2018. See you at the COLLAR booths in future! 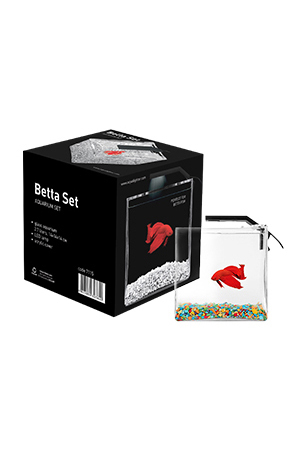 COLLAR on the «AquaTerra show-2017"
Betta set - aquarium set!